We had our exterior painted recently and Hi-tech did a great job. Ron and his crew are very detailed oriented. Ron answered any questions I had and kept me up to date on any changes in the schedule due to weather. They are reliable and affordable. I would highly recommend Hi-tech Painting. Ron is an excellent painter/craftsman and also does a beautiful job hanging wallpaper. Hi-Tech did an excellent job. Quality and professional service. My experience was outstanding in every respect, start to finish. Each of my interactions with the owner/staff from quote to final payment was professional and completely reliable. I would never hesitate to call on Hi-Tech in the future. Thank you for a beautiful job! Professional, timely, friendly service with very reasonable rates and timeline. Will definitely call again!! 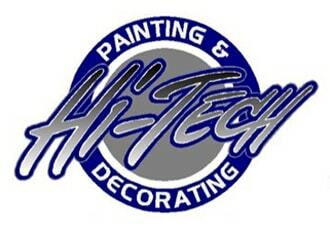 Ron and his staff at Hi-Tech painting were wonderful to work with from beginning to end. They were efficient, professional and very clean. They took pride in their work and worked hard to finish our project to our complete satisfaction. Would definitely use them again and would recommended them with complete confidence. You can’t ask more from Ron. He and his crew are professional and do excellent work. There was great communication before and during the job. His reasonable prices and the fact that he and his crew don’t leave a mess is just icing on the cake! Highly recommend. Ron was a pleasure to work with. He gave me good advice on colors and helped me understand exactly what needed to be done in my living room, dining room, upstairs common area, and a bedroom. His team of Bill and Ray came in a did a great job, were a nice to have around, and finished the job up early. I am very pleased with the work Hi-Tech Painting & Decorating did and would definitely use them again. Excellent work for an excellent value! I can quite honestly say that the painting of our 125 year old cottage at Elkhart Lake, all done by Hi-Tech, and within the time frame stipulated, is one of the finest I have had done. The age of those old timbers presents a real challenge. And I might add that over 70 years of house painting here and in Whitefish Bay I have not had better work. I highly recommend their work. Ron and his crew did an excellent job of painting the interior of our home. They were all professional, hard-working and accommodating throughout the entire project. I highly recommend.